You Look Great in That! 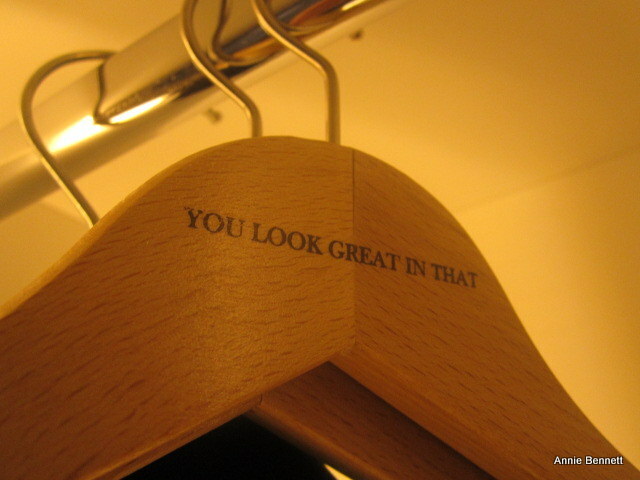 I’ve never been paid a compliment by a coathanger before, but when I opened the wardrobe this rather unexpected message made me laugh and immediately lifted my mood. Just a little thing, but it signalled to me straightaway that staying here was going to be fun. The Only You, a four-star hotel that opened in Madrid in September, feels a bit like a trendy hotel in London or New York. That’s the impression you get as you walk into what was originally the carriage entrance of the traditional 19th-century building. You’ve got a bar to the left and a lounge to the right where you might well spot a star from an Almodóvar film sipping a gin and tonic. Or the man himself, come to that. It is one of the places that seemed to gain cool status the minute it opened. There are some great ideas here – you can have your room for 24 hours from the time you check in, which is obviously brilliant – it would be great if that caught on! Also, you can have breakfast whenever you feel like it, and you can order tapas whenever it suits you and enjoy your food wherever you want to in the hotel too. 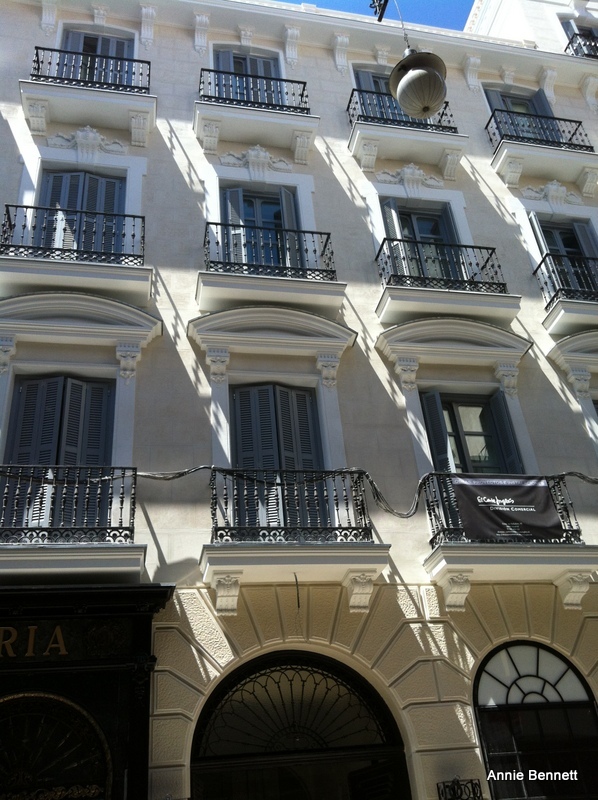 The hotel is on Calle Barquillo, which runs between Chueca, Madrid’s main gay area – which is also, surprise surprise, one of the coolest neighbourhoods – and Salesas, where the elegantstreets are lined with boutiques and smart bars. I have a bit of previous with Calle Barquillo, as I used to live at both number 9 and number 15 in the 1980s. And I lived around the corner on Calle Fernando VI for five years too. Back then, Barquillo was full of music shops, but now it is all fashion, art and food. Chueca was always a big nightlife area, but the bars used to alternate with upholsterers’ workshops and fusty shops selling balls of string or sacks of chickpeas. Pavement cafés and artisanal everything are the order of the day now – more gentrified, less grungy, but still great. Room 211 is classified as Deluxe, which is the standard category. There are 44 Deluxes, 19 Premiums and seven junior suites. It was a bit small but I didn’t care as it was really comfortable and had doors opening onto a balcony opposite the Infanta Isabel theatre on Calle Barquillo. 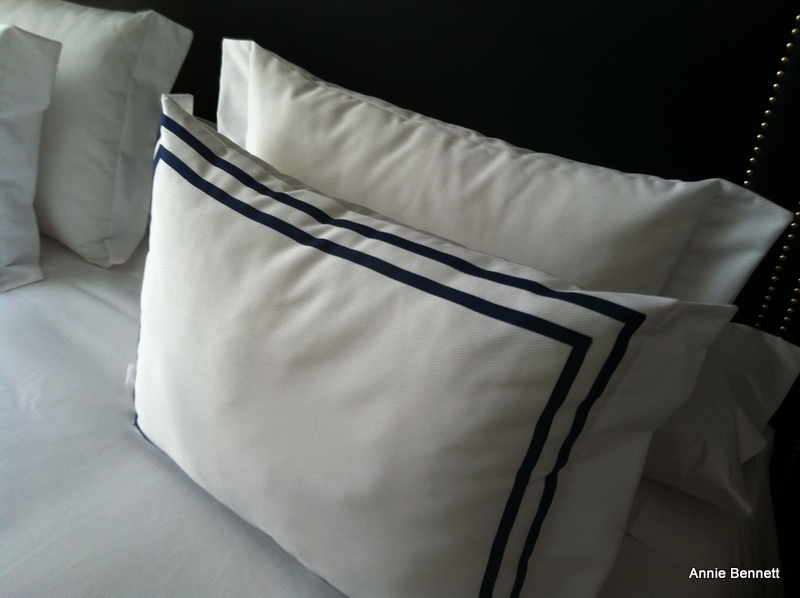 The colour scheme is navy and white – as it is throughout the hotel. For once, glory hallelujah, there is not a hint of the dreaded beige. There are navy and cream carpets with a hexagonal pattern, which felt rather luxurious and a welcome change from the ubiquitous wooden floors. Is there anything more chic than a navy border on a pillow? Well, almost certainly, but I can’t think of it now. I slept really well on the top-quality mattress with supersoft sheets and a goose feather duvet. The TV could do all sorts of fancy things but I was never in the room long enough to bother to work out how to use it for anything more demanding than watching the news. You can download an app onto your iPad (they’ll lend you one if you need it) to get loads of newspapers and magazines – in the unlikely event that you’ll have time for reading, but it’s a nice touch. WiFi is free but connection was a bit fiddly when I was there, as you needed separate codes for your different devices, but this was just a teething problem and has probably been sorted out by now. I would have liked at least two more sockets in the room, particularly by the bed, where there is an iPod dock but no spare sockets – and it’s a faff having to unplug things. There were two by the desk, one by the floor and one by the washbasin, which aren’t going to be enough for two people to charge all their gadgets at the same time and might lead to socket wars. There are old maps of Madrid not only on the walls but also printed onto the sliding bathroom door. All rooms have white-brick shower cubicles with rose and handheld showerheads and marble floors, which again felt luxurious. No bathtubs here though, which I don’t mind at all but I know a lot of people would miss having a soak in the bath. 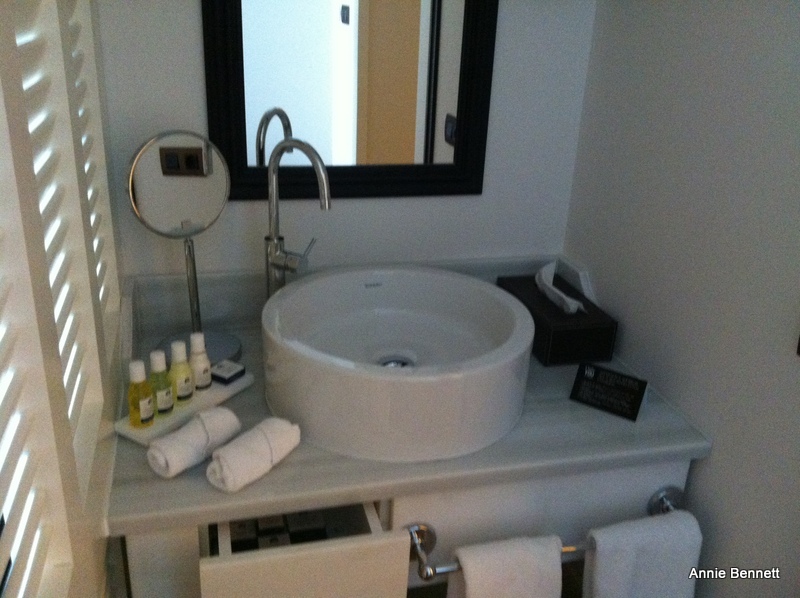 My bathroom was tiny and only contained the loo and shower – the washbasin was outside, but separate from the main room. Toiletries – shampoo, conditioner, shower gel and body lotion in 50ml bottles – are by Hierbas de Ibiza and nice and rich, and there are bathrobes and slippers, which are not standard in four-star hotels in Spain. There is a shaving/make-up mirror by the washbasin, but at the wrong height to be any use – you’d need to be sitting down as if it was a dressing table. Lots of the details are five-star standard and that definitely goes for the service too. The people behind the Only You, which is part of the Ayre group, have obviously thought a lot about what people want from a hotel these days, and what they can do without. It’s somewhere I would choose to stay if I had to book a hotel in Madrid and I’m sure I’ll be arranging to meet friends in the bar and lounge, because of both the handy location and the great vibe. Have a look at the Only You site and if you want to know more, you can read my reviews for the Telegraph and Red magazine. Rooms start at around €150 including à la carte breakfast.